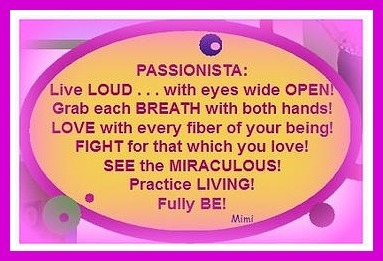 Live life with passion, or not at all. Hi there! It’s me, Mimi! Coming Soon to a Spot Near You! The words I used to put after “I am” were not very nice words at all. I didn’t like myself much. I felt like I could never measure up or please everyone, although I spent most of my waking minutes trying. When I’d do something just for myself I’d feel extremely guilty and like I had to hide it. It seems pretty silly, huh? But my beginnings were a bit rocky, which led me–a person of peace, huge emotions, and big heart–to feel as if I really didn’t deserve love, or even much of a place in this world. After going through a LOT of healing, prayer, reading/study, and consciously changing my thought patterns, I began to view myself differently. Believe me, this process took a long time, but the journey has set me free. When I begin to think of myself with words that cut me down, words that undermine the fabulous person God created me to be, I pull myself back and change them. I remember who I really, really am, the good stuff I’ve discovered about myself, and I change my thought pattern. It does work! I even say some of those things out loud to others, and I haven’t gotten struck by lightning yet!! I urge you to try it. This world seems to thrive on criticism (not the constructive kind), comparison, bullying, and zillions of images that could leave us feeling like a mess. We certainly do not need to be our own enemy by fueling that fire with negative thoughts and beliefs about ourselves!! If you have no idea what makes you fabulous, then ask a friend. (Our friends see and know what we do well, how we have helped them or others, what our personality is like and our strengths.) They can give you a few characteristics to get started. But first of all, above everything else, you are loved. I do not know you well enough to say I love you (but I do care about you). The One who really, truly loves you unconditionally is our Creator, God, our heavenly Father who wants a close and personal relationship with you. And knowing we are loved can change how we feel about ourselves. So go ahead, discover some good things about yourself, and begin replacing the ugly self-talk with uplifting, affirming words instead. I’ve given you an alphabet card below full of suggestions. You are welcome to print it, (please be kind and use only for yourself, as it is my own work) or you can buy a 5″ x 7″ hard copy from my Etsy shop if you desire. I guarantee that if you read these words daily–using them to describe yourself–and begin to believe them (because of course you are all these things), you will become empowered and equipped with stronger self-esteem, self-love, and confidence. Why shouldn’t these words–and more–describe who you are? I now believe that I am these things, and I’m certainly no better than you! I am very excited to hear about your journey. Let me know how you do! And comment below if you, like me, have struggled with negative self-talk. I wish you blessings, truth, and the heart-knowledge that you are loved. So really. Why would you follow in the exact footprints of someone else? They do not have YOUR unique qualities, gifts, abilities, and desires, and you don’t have theirs. Should you fashion your life after what other people say? Should you let what is important to them be what guides you? Perhaps to some degree, if they are people you love. But when it comes to achieving what you truly desire in life, I believe that you need to be the one to determine what is most important to you. And please, do not let people’s opinions of you alter your course one bit! Know your own truth. the kind of person you want to be. these should be things of your choosing and should not be dictated by the choices of others. Of course I am not discounting the wise counsel of people. We all need help with decisions and lifestyle issues. in order to follow blindly. because someone thinks they are silly. because no one else does. because others criticize you for it. You have a brain, emotions, intelligence, reason, values, morals, and common sense. Write your own script for your life! As always, I thank you for visiting. I’d love to know what you think! Do Not Apologize For Who You Are! Oh darling, don’t you know that who you are is the most amazing and fabulous gift to the world? Who you are is full of wonder and possibility. You deserve to be loved and fulfilled in what you do. I know it’s tough many days. I know some of you are not in an ideal situation. I know some of you feel as if the ground is swallowing you up and closing in over you. I know because I’ve been there. And it took action and big steps (in little baby steps) to get me out of that hole. But I am here to tell you that YOU can start today to change your situation. There are people who will help you. Do not try to do it alone. I know, precious one, that you feel as if you must be strong and do this life thing (as hard and unpleasant as it is) by yourself because that’s who you are. Well, you only limit yourself when you limit your possibilities. Start talking to people. Start saying what you want and need. I promise, lightning will not strike you. Start asking for help. Start with someone you trust and get them involved in seeking help you and ways to improve and/or get out of your situation. You are NOT alone! You do not have to suffer in silence. There ARE solutions. I know. I found them. The biggest thing is to start realizing how valuable you are. How much the world needs your special, unique gifts and love. Start telling yourself the TRUTH–that you are amazing and have wonderful abilities and gifts for this world. Start seeking ways to BE who you really are. To pour out your beautiful spirit and shine your gorgeous light. Because darling, you are perfect, just as you are! Never apologize. Having children with special needs is such a challenge! But one thing I’ve learned….it keeps us TOTALLY dependent on God. No way can I be “in control” because in the blink of an eye, our life could be in shambles. There are days my prayer has been, “Oh God, oh God, oh God” because I just didn’t have words. Didn’t have energy to formulate words. It was all I could do to breathe and take care of my children (I am their only parent). Some weeks (months) every.single.day is a challenge. Like pushing a locomotive up a steep mountain. And then, thank God, we will get a reprieve and I can at last take a deep breath. And I just sit. And sit. And let God fill my mind, body, and breath. And He brings healing to my emotions. Because there is no doubt about how emotionally draining it is to watch your child hurt, or be disappointed because of physical limitations, or become emotionally so out-of-sorts that all day is a battle. Or how physically and emotionally exhausting it is to be making hard, frustrating, impossible decisions for the duration of several days. Sleep-deprived, worry-filled, and constantly searching for solutions can totally wring a person out! But oh, God is able! The video below is amazing and so uplifting. Mandisa sings her song Overcomer with clips of people who have overcome some extreme physical challenges. I equate the physical with our mental and emotional challenges. It’s not an easy journey (Wait, what? It’s gonna be hard? Hey, I didn’t sign up for that!!!) But a journey that I hope will bring God glory. Because the glory is all His. Anything that I’ve accomplished with my children has been while He was holding my hand, speaking into my spirit (sometimes I didn’t want to hear Him–la la la la la! ), and guiding my every move. Because I was useless. Incapacitated. In spite of that, and because of Him, my children are amazing miracles. But that’s a story for another time. Enjoy the video. You will be hooked! Thank you so much for stopping by. YOU are the reason I write. I’m Going Live! Check It Out! It seems my words of the year “Expand” from last year and “Abundance” for this year are working for me! Sometimes it really takes just putting one foot in front of the other and doing what you know to do at the time. So carry on with your bad selves, shine YOUR light, and rock 2017! You didn’t sign up for my blog to receive news about my Empowordment Cards, but because positive self image and encouraging others is my THING, these cards are a part of ME. Sooooo…. I won’t do a bazillion posts about them. BUT…. I have put a bunch of cards on 50% off sale, and I thought you might want to know. Some of these designs are the first ones I created TWO years ago! And while I love them–they are like my babies, after all–I need to make room for some new designs. Sixty-three cards is a lot to manage, especially when they decide to throw a party behind my back! And let’s not talk about carrying them around when I do shows and such! Ugh! Can we say weighsalot? This is a great time to stock up on cards for the year. I mean, where can you purchase a colorful, unique, glossy, heavy-weight, Mimi-designed 5×7 greeting card for $1.50? These are works of art, people. Well, some folks think so! I mean they are all the rage in NYC!! and just plain ol’ encouragement. Take a walk on the wild side and browse on over at my shop to choose the ones you want to stock up on. Click right HERE to gain entrance to the much-coveted SALE section of my Etsy shop. Shhhhh, you are the first to get a shot at it. But tomorrow I’m tellin’ the WORLD!! And thank you soooo much for being my READERS!! I can’t even tell you what it means! P.S. My watermark (logo) does not appear on the front of the cards you buy. It’s just for copyright purposes that it’s on them here. It doesn’t matter what is being said about you. It doesn’t matter what others think of you. What matters is what you think of yourself! And if you believe lies about yourself, then you will act on those lies instead of the truth. Any words that make you seem “less than” the amazing person you were created to be is a LIE! Those words may come from the chatter in your brain, just regurgitating things you have heard. They may come from actual people who are small-minded and have their own agenda. But whatever the source, you need to STOP listening to the derogatory lies and begin to speak truth to yourself. Because when you believe lies, you think small about yourself. It’s pretty hard to launch out of your comfortable, ho-hum, dream-draining life by thinking small. You can barely rise to doing those things the world needs from you–your purpose for being here. And leaving your comfort zone is like jumping off the high dive. But don’t you want to be the best you can be? Don’t you want to realize amazing and wonderful things about yourself–things you never knew? When we rocket ourselves (because that’s what it takes!) outside of our comfort zone to do those things that our heart really, really longs to do, all kinds of new worlds and information opens up to us! It could become quite an adventure–mine has! And the wonderful thing is that our hearts and spirits become more fulfilled as we begin to venture out and try things our heart is leading us to do. “I am not smart enough for that. I could never go in front of people. I really do not have the “look” required for that. I don’t have the time for that. I’m just a ________.” Oh how I hate that word! The lies (excuses) are limitless. The only thing holding you back is you. Stop believing lies and restricting the amazing, capable, beautiful person you are! You CAN do this! I know, because I did. Love and big sparkly hugs! I speak from experience!! Seriously! If you would like to read more, here are some older posts on the subject. Sparkle & Shine Calendar is Here! Goodness this last six months has been incredibly busy. I seriously don’t know how I had time to teach full time before I retired. Of course, I’ve added three jobs since then, all of them MY businesses. And I am entirely responsible for all three. That along with raising two special needs kiddos in their teen years (and all the doctor visits involved with that) has kept me super busy. I will catch up on happenings later. Right now I want to show you my 2017 calendar! I’m very excited about it. Instead of using a template with the borders provided like the last two years, I created all my own borders. I also decided that instead of using my previously published cards, I would design all new ones. This year I focused on affirmations. For half of the months you have three “I am” statements to read every day. Thus you will hopefully integrate them into your spirit! For the other six months I have given written statements about you. I truly enjoyed creating this calendar. I know it will make a difference in your self-esteem and also in that of the females in your life. It’s a great gift for friends, daughters, granddaughters, nieces, ANY person who could use a little reminder of how amazing and capable they are–which means all of us! Visual reminders are the best!! And then when we say these words out loud? Oh yeah!! Way to start believing them. We can reprogram our brains to think the truth about who we are, instead of listening to the lies we tell ourselves. The pages are easy to write on, which is important in my book. Glossy on the picture and matt on the calendar. Perfect! The squares marking each day are a bit over 1 1/4″ square, large enough to jot your goals or achievements down. Great for marking progress each day! Size is 17″ by 11″ when open so it can tuck into a small space. But it will make quite the visual impact! Place by your bathroom mirror to give you a message every morning, or in your office or work area so that while you are daydreaming you’ll be reminded of WHO you are!! I really hope you will add one of these to your life because you deserve to be told how wonderful you are on a daily basis! If you’d like to purchase you can go to my shop on Etsy. Have a great day, my friends! Are You Making Numb Choices? It seems we are always hearing how important focus is to reaching our goals and bringing our desires to us. However, sometimes our focus is totally off. We work hard, do what we think we should, spin our wheels, and run faster on the hamster wheel, only to remain stagnant. Why do you suppose this is? Well, one possibility is that when we are determining our focus, our brains are actually numb. If you want to read a funny story that illustrates this point, go here. While somewhat “asleep” we are fully intent and focused on carrying out our daily lives, getting to the “other side”, even attempting to achieve goals or dreams. Sometimes, our minds and hearts have become numb and we are making decisions based on survival, rather than fully living. I’ll share with you 5 reasons I think we become numb, and 4 ideas of how to awaken in my article here. I hope you will read it and take to heart the joy of living fully alive! YOU were born to shine!! Do you believe that? Or do you struggle to believe that you were born to shine because instead you believe lies about yourself? Perhaps lies like you are stupid, unlovable, you will never amount to anything, you are ugly, or you are worthless. If so, these lies are the result of believing negative things you have felt or that people have said about you. Many of us have done that and are now full of hurt and feel broken. So what do I mean when I say “lies”? Lies are thoughts or the words and actions of others that cause us to behave in a self-defeating or destructive way. Lies are limiting because they create FEAR and hold us back. Firmly Encouraging and Allowing Rubbish. When we listen to all that rubbish going on in our brain it’s impossible to be our real, true selves. Most likely we haven’t been taught about how thought processes work so we continue to believe rubbish about ourselves. It piles up over the years until we have a whole ton of garbage that weighs us down. My goal is to help you, in a simplified way, understand how our thoughts can work against us. The lies we believe during our formative years set us up to believe lies as adults. By the time we become adults we are firmly entrenched in this belief system which affects how we consider ourselves. So how do we change our belief system so we can change our behavior? Find out how by reading my article here. If you’d like to read my first post on this subject (because it’s one that is dear to my heart), find it here. May your life be blessed as you incorporate these ideas to help you live with fullness and freedom from the fear that binds. Please visit my shop and look around. Even if you don't buy anything your heart will be lighter because of your visit. Just waiting for flowers. I'm soooooo ready! (Hope it doesn't snow!) * * ~ #springiscoming #springplanters #imusthaveflowersalwaysandalways #yardgatherings #comeonbouquets #everypinkflower #maybeafewpurpleandyellow.